You may have noticed that there is a new banner, at the right hand column of the site, advertisig Gun Butter, the latest, greatest, meanest, or whatever else you want to call it, firearms lubricant in the market. The banner is there obviously for M1911.ORG to gain some sponsorship money, but also because this product is really what its makers claim it to be. In one word, excellent! 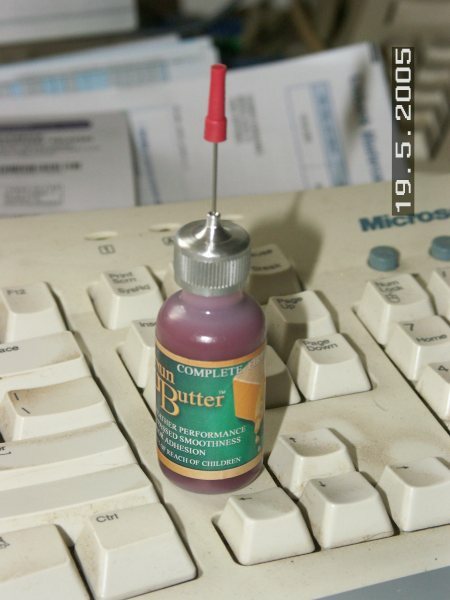 Here is what you get, when you order a bottle of Gun Butter. Admitedly, it's a small package (so do expensive perfumes), but believe me, this thing should last you for a long time. 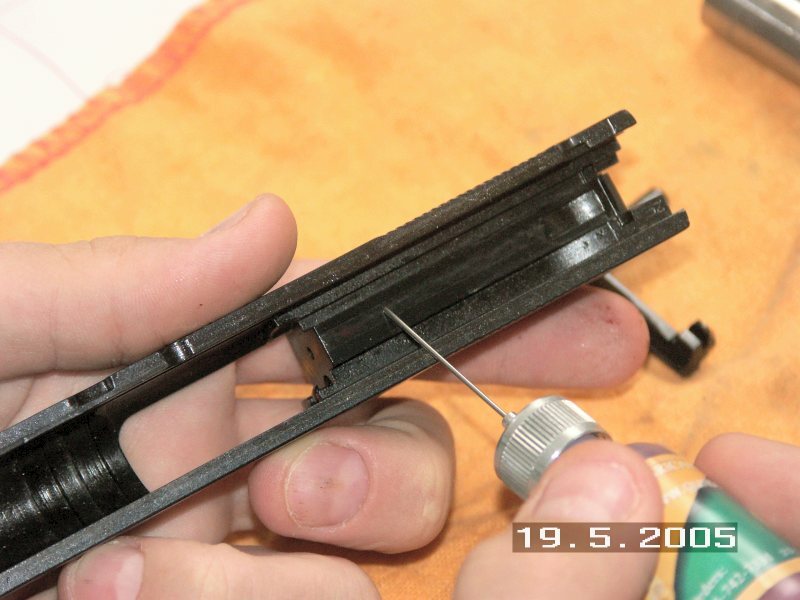 As you can see, the applicator nozzle is quite thin, like the needle of a syringe, or even thinner. And there is a reason for that. 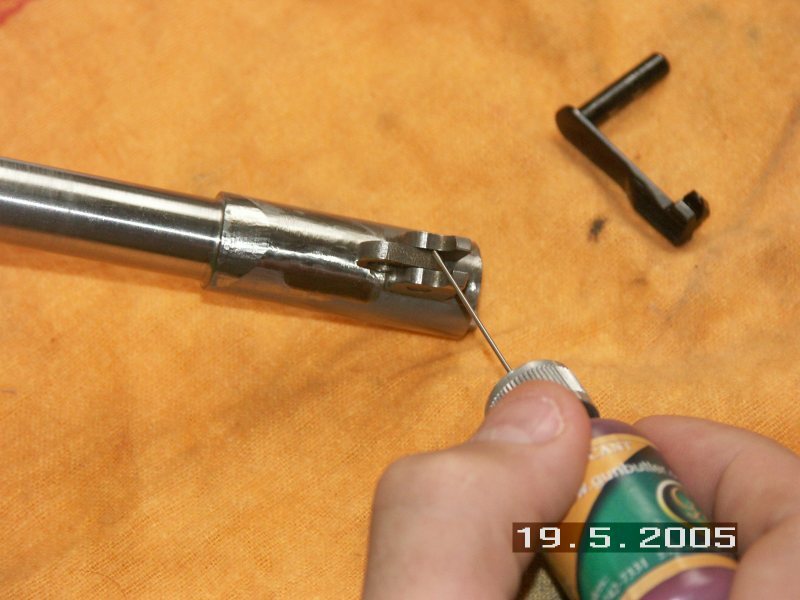 You do not need a large quantity of the lubricant, for it to work. According to the literature that came with the product, you have to think of it as "micro-mono layer" lubrication. In other words, a little goes a long way, and the product literature warns you against using too much. The lube itself is a reddish fluid, judging by the Gun Butter advertisement, I would expect it to be ... yellowish, but who cares? - The product covers a very wide spectrum of temperatures. - It is also a cleaner, since it breaks loose any dirt and lifts it from the metal, thus making cleaning job easy, after the initial application. - It offers up to two years of corrosion resistance, in 100% relative humidity environment. - May be used to rub out existing rust spots. Even though I would love to learn some chemical details of this formula, the makers are (understandably so) not mentioning a single word. My chemist background was unsatisfied, but anyway. So, I set out to find out as much as I could about this product and verify if the makers claims are true or not. 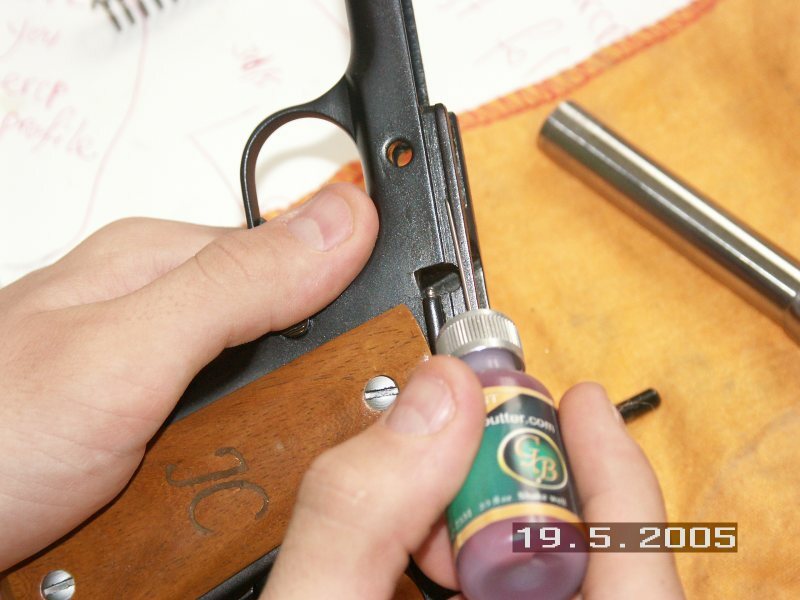 Of course, the first test was to lube one of my pistols with it and see if there was any difference. My trusty .45 ACP 1911 was thoroughly cleaned and degreased, as per the instructions (Gun Butter does not like to be in close contact with other lubricants, such proximity can reduce its effectiveness, which makes sense). 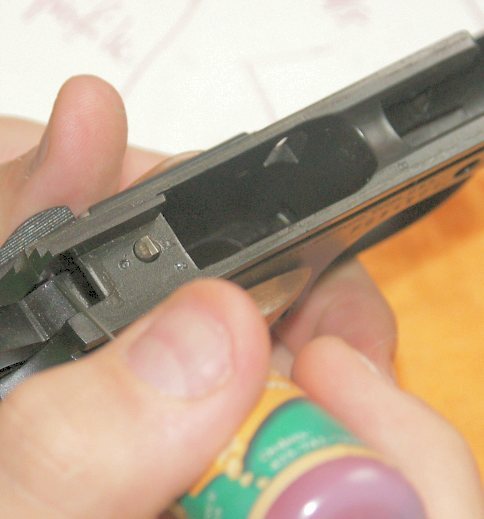 For cleaning and degreasing purposes, I used whatever I had left from the Slip2000 Gun Cleaner and Degreaser 725 (it's amazing how this product will remove dirt from your pistol). 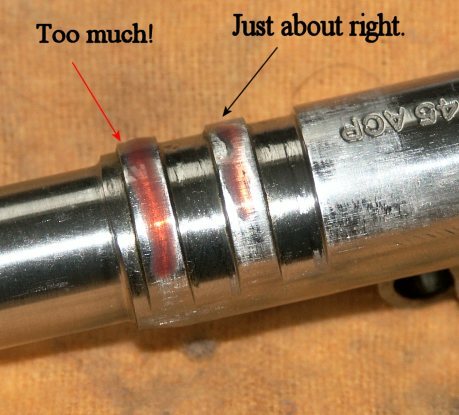 After I made sure that all parts were totally free from any previous lubricant, and shiny clear, I used my common sense on where to lube, diverting from the manufacturer's recommendations (after so many years around 1911s, I think I know where the pistol needs lubricant). A very thin line was spread on the bottom of the slide, where the disconnector rubs. A couple of drops, inside the slide rails. A few tiny drops on each slide rail. A couple of drops on the disconnector. And on the sides of the hammer. However, I followed the instructions as far as the quantity of the lubricant applied were concerned. 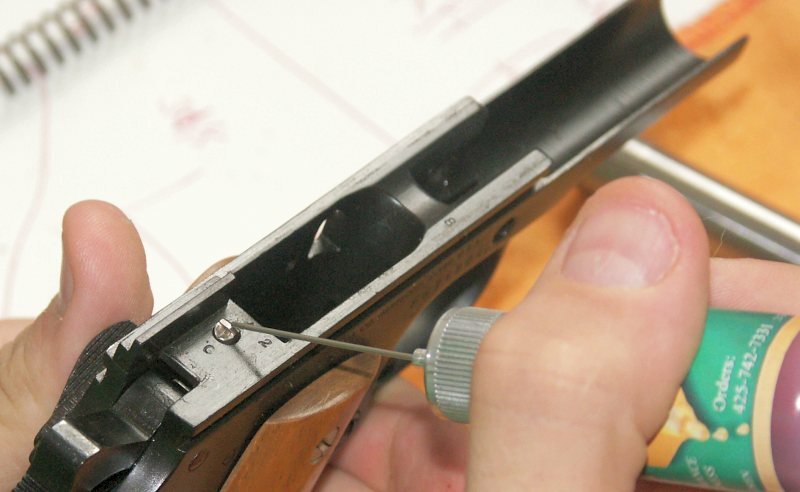 Gun Butter's needle applicator, allows you to apply very small quantities of the lubricant, where it is really needed. A tiny drop, spread around by the nozzle of the bottle and I hoped that I have the micro-mono-layer (or whatever they called it) coverage. 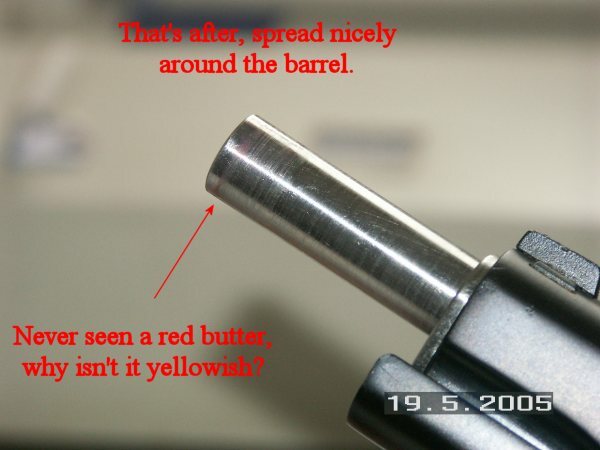 Some Gun Butter on the barrel lugs, to show that a lot is not always good. 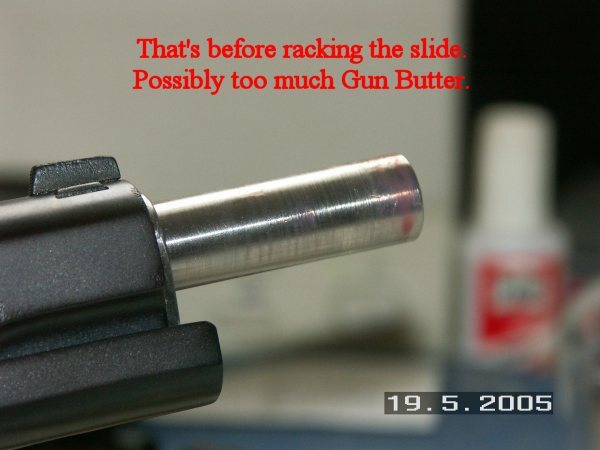 After completing the lube job, I racked the slide a couple of times, to make Gun Butter spread around in the areas that it was supposed to cover. Then, I put the pistol aside for a while, to see if any of it would flow away. After about an hour, I checked the pistol again, and was surprised to see that none of the reddish material had flow out of the pistol. I racked the slide a couple more times and I disassemble the pistol again, to check for coverage. Sure enough the reddish material was all over the proper surfaces. I can't say that I noticed a great difference, in the way the pistol parts interacted with each other, as other people say they noticed when they tried Gun Butter. 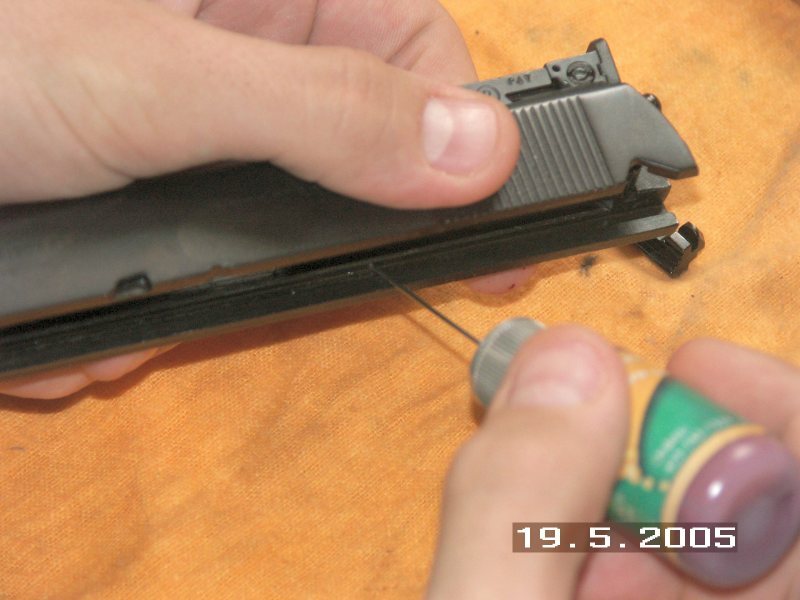 What I did notice was that the operation was as smooth as ever and that there was no trace of the lube on the outside of the pistol. So far so good. I plan to take the pistol next weekend, to the range, to give it a real test. Usually, this is where I stop, when testing pistol-related things, but this time the scientist in me surfaced and I decided to take this test one stop further. OK, the manufacturer claims two years of protection in 100% humidity? Let's try to prove that. Unfortunatelly, I do not have access to a 100% humidity chamber, so I did the next best thing. I used an old, semi-rusty firing pin stop I had, which I cleared up and then covered one side of it with Gun Butter and left the other one, as it was. 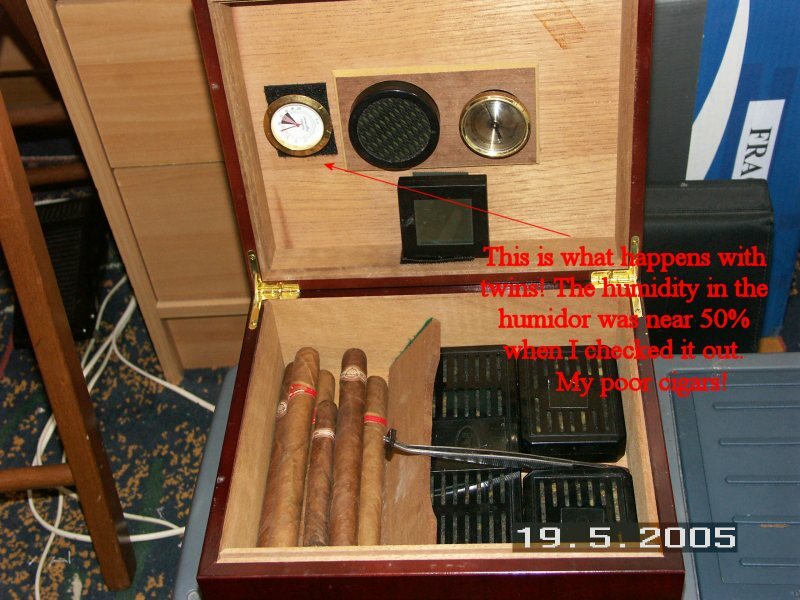 Then I put it in my cigar humidor, which is at a constant 70% humidity and left it in there. 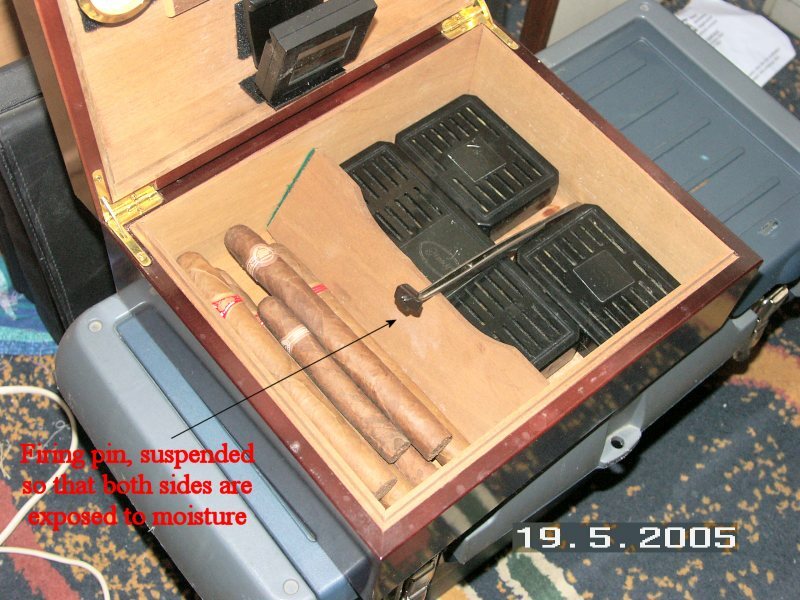 I 'll check it again every week and see how it goes.The picture below, is of the firing pin stop in the humidor. Darn, I had forgotten to check the humidor for a long time and the humidity had dropped to around 50%, instead of the recommended 70%. Not good for my cigars. One final thing. If you want to try Gun Butter for yourself, M1911.ORG has arranged a special deal with its maker. Click on the banner to your right, to go to the manufacturer's web site and order a bottle. But remember, when you fill in your contact details, there is a coupon field. In that coupon field, enter the word "m1911" without the quotes. This will give you a 1 US$ discount on the retail price of the product and it will also give me a small commission, which will be used to keep M1911.ORG alive and growing. So, use the banner here, you will get a great product and help this site stay alive. Don't forget to enter "m1911" in the coupon field.